She’s the target, the scientist he’s been told to bring down and here she is swinging helpless in a crevasse in Antarctica. What should Kirk Barnby, secret service agent, do? Cut the rope? In this taut and exciting clash between environmental activism and nation-state power, which veers across Antarctica, New Zealand, Hong Kong, London and Istanbul, two very determined people have to make a series of time-critical choices – political and personal. Sadie Rosenberg is hanging down a crevasse in Antarctica, refusing to cut free her friend Bill who is hanging beneath her, making it impossible for another friend, Sean Tomasin, to haul her to safety. Sadie and Sean, and a large Antarctic diamond in their possession, are saved by another geology team headed by Kirk Barnby – Bill and two others of Sadie’s group perish. Is Sadie “A protestor, political lobbyist, a greeny activist, an internet whistle-blower, internet pirate, a low-level diamond thief … diamond smuggler … terrorist”?, is she even Sadie Rosenberg? And who is Kirk – a geologist, a soldier, a government agent? And whose side is Sean on? Eye of the Songbird is a novel that shouldn’t work, and I suspect it won’t for every reader – it is an ideological dialogue fest, with every character intelligent, articulate and well-rehearsed. There were times when reading that I felt like Kirk reading a manuscript Sadie sends to him: “He read. Got weary. Read more.” But these times were fleeting and somehow the endless series of dialogues in this piece of Cli-Fi work. The writing is intelligent and manages to present arguments in a nuanced and subtly developing way. 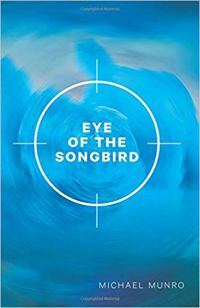 Eye of the Songbird isn’t a thriller in the sense of adrenalin action – Sadie is being pursued, and some of her pursuers have serious damage in mind: “First I’m defending the environment, then everybody’s personal information, and now my actual existence”, but that chase is just part of the discussion, as is the fact that for most of the novel we are guessing whether she truly is the head of a vast subversive organisation, under the alias Songbird – our concerns in that regard are more that she appears to be involved in some pretty shady dealings, so is she of ‘the end justifies the means’ side of the room? i.e. “To sustain a fight over time you probably need to become the thing you’re fighting.” Or is she “… a vault of independent thought outside the state’s orthodoxy”? We know Kirk Barnby works for a New Zealand outfit linked to a UK government agency, and that he has moments of PTSD vulnerability. He has been sent to check out Sadie because: “The charmless weren’t short-listed for this operation” – a tactic that backfires when Sadie and Kirk have an instant attraction: “From the crevasse had emerged two life-changing entities – the diamond and the woman beside him.” So, Eye of the Songbird becomes a kind of romance novel – amongst all the positioning and arguing, where does love fit, especially between two people who are suspicious of how much they can trust the other? “There’s a personal truth in every man’s point of view” and Sadie and Kirk spend a lot of the novel trying to determine each other’s personal truth. The main thrust of the novel is in the irreconcilability of its political arguments, for example the wildly off the mark “What’s all this primitive mysticism around nature anyway? A tree’s a tree – not some Lord of the Flies god” in the face of simple truths, “You can’t eat money or drink oil.” And the clever use of: “It’s not quite our land. We just happen to live on it” – an argument often used to suggest raising refugee quotas, but in Eye of the songbird used as an argument for welcoming foreign mining interests. And even if environmental groups could mobilise the masses with arguments of truth and consequences, there is the concern that: “Shutting down the free world’s economies, while others rack up all the smog and sludge, won’t get rid of the problem” – so some pretty apocalyptic conclusions. And there is a truly chilling possibility that emerges towards the end of the novel, and hints in the final scene back in Antarctica that the possibility is a probability. I thoroughly enjoyed the novel and its endless array of views: “… society is a tool for individuals to get on with their lives”, “The price of living in a free society is learning how to be offended” and my favourite: “Humans can be the dumbest of dumb animals. Even a flower knows its purpose better.” A great debut novel – read it and see what you think. Alyson Baker is a crime-loving librarian in Nelson, New Zealand. This review is co-published on her blog, which you can check out here.